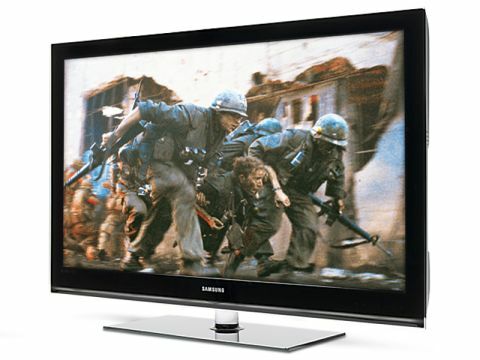 This elegant 46-inch LCD TV giant is one of Samsung's most lusciously designed TVs and its best LCD performer yet. The LE46B750's glass screen surround is coupled with the stand's central, vitreous pole to create a sophisticated and unique look. It may not have one of the all-new LED panels found on the company's high-end Luxia range, but the LE46B750's use of Motion Plus 200Hz technology helps make this a top draw telly. Hook up the Ethernet port at the rear to a router and Samsung's closed Internet@TV platform, as well as its DLNA-powered PC networking feature, are enabled. Other points of note include energy saving (low, medium, high and even a 'picture off ' option that's ideal if you intend to listen to digital radio via Freeview), a 'Contents' library of media, and some excellent user interfaces. While the menus could be sharper in appearance, in all other respects they're among the finest around. Floating over the onscreen action, they provide a line of explanation at the bottom of the screen for each option. Our only criticism is that the menus are slow to navigate using the remote control. Otherwise excellent, the elongated remote is overcrowded, but that's no surprise, given the number of features. Internet@TV is becoming increasingly impressive as 2009 wears on. The Yahoo-powered platform's widgets load inside 20secs, and after some basic set-up procedures it's possible to create personalised profiles for multiple users. YouTube, Flickr and Yahoo weather are the backbone of the service so far, though we did have trouble with the former; while we got online okay, scrolling through the widgets is very slow and YouTube just wouldn't load. Media Player proved a letdown; the LE46B750 failed to detect either of the USB memory sticks loaded with digital media files we'd inserted into the TV's side. Not so the LE46B750's DLNA networking, one of its most useful and impressive features. It works a treat, finding and playing all kinds of video, music and photos stored on any PC or Mac. We successfully streamed some video podcast files stored in iTunes, as well as DivX, AVI, and even AVCHD videos. Motion Plus 200Hz helps to lift the LE46B750 into the upper echelons of LCD TVs. Set to 'Clear' mode, the Blu-ray disc of Full Metal Jacket is virtually blur and judder-free. As well as upping the refresh rate, the system interpolates its own frames of video to get rid of ghosting. It's successful and subtler than on other sets and, while there's arguably less of a 3D-feel than on similar rival systems, here it's free from artefacting. Switch to the highest 'Smooth' setting and flicker does appear around moving objects, but 'Clear' mode solves the problem. Contrast-heavy HD pictures and bright, bold and well-saturated colours dominate, producing a cinematic image that challenges the best plasmas; this set truly gets the best from Blu-ray. There is a flipside to the TV's pin-sharp and immaculately coloured pictures. Step off-centre to the screen and the contrast immediately starts to drain. This is a serious home cinema screen, and like a sound system, it's got a sweet spot all of its own, but there are few LCD TVs sweeter than this one when it comes to hi-def. Pictures from Pro Evolution 2008 from an Xbox 360 look okay, even using the movie mode, although close-ups of animated characters do suffer from flicker. Switch to digital TV and channel logos and graphics break up and wobble constantly, even though the picture itself is always watchable. DVDs, meanwhile, are scaled to match the 46in screen more successfully. Pictures enjoy the same contrast and colour accuracy, though edges are noticeably less distinct than HD and some picture noise is visible. The speakers disappoint, though SRS TruSurround HD is useful. It's possible to activate while also choosing between the music, movie or clear voice presets – recognition that films demand vastly different audio treatments. SRS TruSurround HD works pretty well on Full Metal Jacket, pulling out background effects such as helicopters with the movie preset added, though dialogue can seem lost. Whether the LE46B750 is a huge step forward from the brand's low-spec sets is arguable, since only 200Hz Motion Plus has been added from the Series 6 LCD TVs. What is clear is that it offers some of the best pictures liquid crystal has yet managed. The excellent design and build quality, smooth and perfectly coloured images make this a knock-out set.